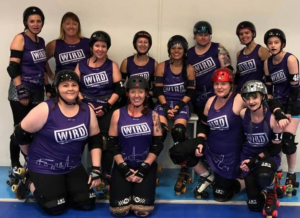 Two Coledale locals are strapping on their skates later this month to jam, scrim, drop and cut in the world’s largest roller derby tournament. Lachlan Donne and Rochelle Merrick will be among the team from the Wollongong Illawarra Roller Derby League travelling to Adelaide for the three-day event, to do battle with teams from all over Australia and New Zealand. Rochelle skates in the team. Lachlan is the Alternative Benchie. It’s his job to communicate to the girls while they’re competing with a combination of yelling and hand signals. “I think I got the job because I have a loud voice,” he laughs. 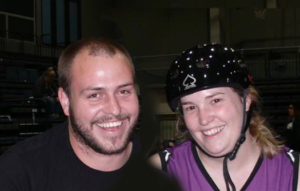 Lachlan says he was doing job for the then-president of the Roller Derby Association, saw some photos, got to chatting, and after watching a game, fell in love with the sport. 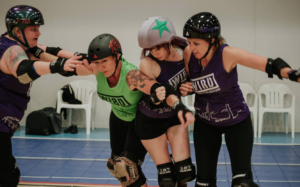 Roller Derby is ten women skating at full speed as they try to both push through the pack, or stop others from pushing through. It’s physical, noisy and fantastic to watch. The league is sending a team of 11 skaters plus three bench aids, including Lachlan and Rochelle, and the girls are hoping to take home the title. Team spokesman Amy Joyce (otherwise known as Kranky Crumpet) is looking forward to some serious action. 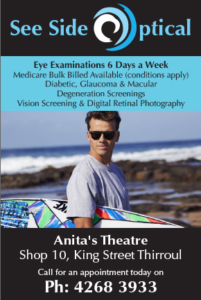 The skaters have had to work hard not just physically but also financially to make the journey, holding multiple fundraisers to scrape together funds for the tournament. For most of the girls this is their first time heading to Adelaide for the slam, but they are joined by some veteran players who have been fantastic mentors to the new players. Player of five years Ebony aka Ebz Cutioner saying, “How fantastic it is to see the team growing with new fresh meat”. The team heads to Adelaide on Friday the 8th of June, with the tournament running across the long weekend (9-11th June).